Bill Cosby will learn his punishment Tuesday as a judge decides his sentence. Declaring Bill Cosby doesn't deserve a free pass because of his advanced age, prosecutors on Monday asked a judge to sentence the comedian to five to 10 years in prison for drugging and sexually assaulting a woman, while the defense argued that he is too old and helpless to do time behind bars. "What does an 81-year-old man do in prison?" defense attorney Joseph Green asked on Day 1 of the sentencing hearing for Cosby, who is legally blind and dependent on others. "How does he fight off the people who are trying to extort him, or walk to the mess hall?" Green suggested that Cosby instead receive something akin to house arrest. Montgomery County District Attorney Kevin Steele said that he has no doubt Cosby would commit another such offense if given the opportunity, warning that the TV star seemingly gets a sexual thrill out of slipping women drugs and assaulting them. "So to say that he's too old to do that — to say that he should get a pass, because it's taken this long to catch up to what he's done?" Steele said, his voice rising. "What they're asking for is a 'get out of jail free' card." And he said the sentence should send a message to others. Judge Steven O'Neill is expected to sentence Cosby on Tuesday. The TV star once known as America's Dad for his starring role in "The Cosby Show" could become the first celebrity of the #MeToo era to be sent to prison. Cosby was convicted in April of violating former Temple University women's basketball administrator Andrea Constand at his suburban Philadelphia mansion in 2004. Tuesday will mark day two of the sentencing phase in the Bill Cosby trial. Bill Cosy's chief accuser testified at Monday's sentencing hearing saying she just wants justice. "The jury heard me. Mr. Cosby heard me. Now all I am asking for is justice as the court sees fit," said Constand, who submitted a much longer victim-impact statement that wasn't read in court. Steele quoted Constand in her statement as saying that Cosby took "my beautiful, healthy, young spirit and crushed it." The three charges on which Cosby was convicted carry up to 10 years in prison each, but both sides agreed to merge them together for sentencing because they stemmed from the same encounter. State sentencing guidelines call for about one to four years behind bars on the combined charge. The judge is also expected to decide whether to declare Cosby a "sexually violent predator" — a scarlet letter that would make him subject to mandatory lifetime counseling and community notification of his whereabouts. 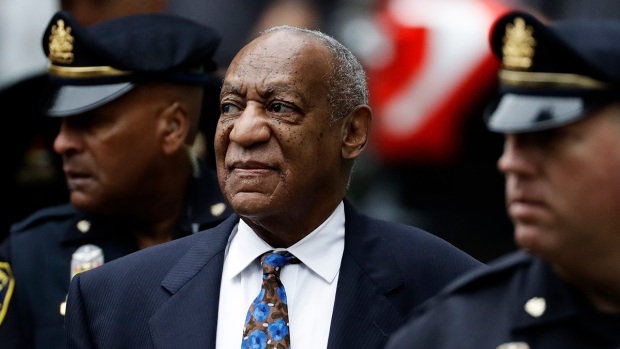 On Monday, Kristen Dudley, a psychologist for the state of Pennsylvania, testified that Cosby fits the criteria for a sexually violent predator, showing signs of a mental disorder that involves an uncontrollable urge to violate helpless women. A psychologist for Cosby's side is set to testify Tuesday. Cosby's lawyers argued that the state law on classifying sexual predators is unconstitutional. They contended also that Cosby is unlikely to commit another crime because of his age and health and because there have been no complaints that he molested anyone in the 14 years since his encounter with Constand. "The suggestion that Mr. Cosby is dangerous is not supported by anything other than the frenzy," Green said, alluding to protesters outside the courthouse and public debate about the case. Constand's mother, Gianna, also took the stand Monday and attributed her health problems to Cosby-related stress. She accused Cosby of "ruining many lives." "I can only hope and pray that some sense of peace and faith can be restored back on our family," she said. "The victims cannot be un-raped. Unfortunately, all we can do is hold the perpetrator accountable." Cosby's side didn't call any character witnesses and touched only on his life and fame, noting how he had been poor, dropped out of high school and served in the Navy before soaring to stardom. He will be given the opportunity to speak in court before he is sentenced. Monday's proceedings took place as another extraordinary #MeToo drama continued to unfold on Capitol Hill, where Supreme Court nominee Brett Kavanaugh faces allegations of sexual misconduct from more than three decades ago. From probation to decades in prison, attorney Dennis McAndrews lays out the punishments Bill Cosby faces at sentencing in Montgomery County. Cosby, looking grim, walked into the courthouse Monday morning on the arm of his longtime spokesman as protesters shouted at him. His wife of 54 years, Camille, was not in court. Several of the jurors who convicted him watched the hearing on a monitor in an overflow courtroom. Cosby spokesman Andrew Wyatt told reporters in the afternoon that the entertainer was in "great, great" spirits. "We tell him to stay strong and stay focused, and he's focused on Mrs. Cosby, and that's what matters in his family," Wyatt said. "He's a great guy. He's still America's Dad, and they won't ever take that away. You can't take away the legacy." In the years since Constand first went to police in 2005, more than 60 women have accused Cosby of sexual misconduct, though none of those claims have led to criminal charges. At least two of those women, including former model Janice Dickinson, were in the courtroom for the start of the sentencing. Prosecutors had hoped to have some of the other accusers address the court at the hearing. But the district attorney's office told The Associated Press that that would not happen. A few hours before the hearing, Constand tweeted Ephesians 4:26, a Bible verse about letting go of anger: "Be wrathful, but do not sin; do not let the sun set while you are still angry; do not give the Devil an opportunity." 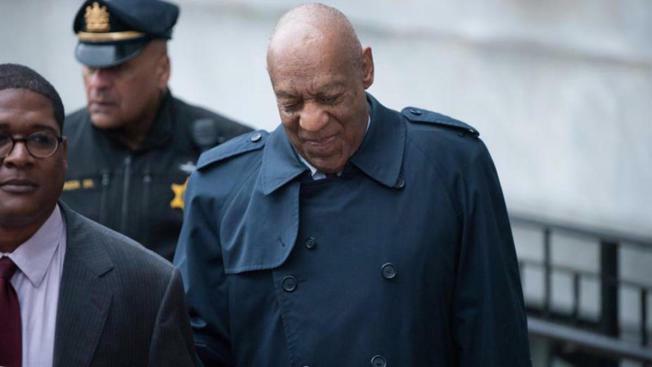 Bill Cosby arrived at the Montgomery County Courthouse early Monday, where a judge will decide if the 81-year-old comedian will go to prison as a result of his sexual assault conviction. Cosby, who grew up in public housing in Philadelphia, became the first black actor to star in a prime-time TV show, "I Spy," in 1965. He remained a Hollywood A-lister for much of the next half-century, hitting his peak in the 1980s with the top-rated "Cosby Show" as the warm, wisecracking dad, Dr. Cliff Huxtable. Associated Press reporter Claudia Lauer in Norristown contributed to this story.